Dubai: Bryson DeChambeau, the hottest prospect in golf today, has been called many things by many people, including the ‘mad scientist’ by a certain Tiger Woods. But if there is one moment that came as sweet music to the magically gifted American’s ears, it is when he was referred to as the Omega Dubai Desert Classic champion — his first international victory in a career that is has skyrocketed in recent years. DeChambeau fired an eight-under 64, for a four-round aggregate score of 24-under-par, and finished seven strokes ahead of England’s Matt Wallace. The previous highest margin of victory was six shots by Ernie Els over Australian legend Greg Norman back in 1994. Defending champion Haotong Li set the record for the lowest four-round aggregate of 23-under 12 months ago. The world No. 5 rolled in six birdies together with a spectacular eagle on the par-five 10th hole against a sole bogey on the Par-four 12, to record the lowest 72-hole total in the tournament’s history. As the sun set on the 30th edition of the prestigious tournament, golf’s new rising star stood tall as he received the glittering ‘Dallah’ Arabic Coffee Pot Trophy, from Shaikh Ahmad Bin Saeed Al Maktoum, President of Dubai Civil Aviation and Chairman and Chief Executive of Emirates airline. “Today, I was happy with my game. I executed a lot of great shots,” DeChambeau said. The new champion also credited his team and his unorthodox ‘scientific’ approach to golf for his victory, the sixth in a row. It is not without reason why the Classic is regarded as the jewel of the Middle East as the tournament has been won by some of the most famous golfers in the world — including the likes of Seve Ballesteros (1992), Ernie Els (1994, 02, 05), Fred Couples (1995), Mark O’Meara (2004), Tiger Woods (2006, 08) and Rory McIlroy (2009, 15) who between them they have won 35 Major Championships. DeChambeau, who is making it a habit winning big tournaments around the world, added his name to that elite list in emphatic style on Sunday. From the moment he birdied the first three holes at the start of the final round at a pristine Majlis Golf Course, you knew you were in for something magical, wonderful and so very exciting. 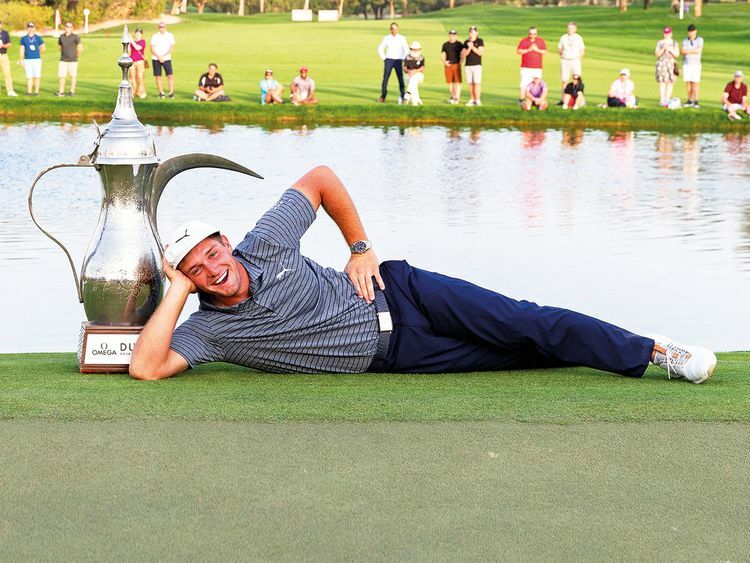 There are times when you watch great sportsmen do impossible things that make you pinch yourself and it was one of those days when DeChambeau reeled off one impossible shot after another — off the tee, from the rough, out of the bunker and on the greens. Meanwhile, defending champion Haotong Li made an honourable defence of his title with a one-under 71 to join Ian Poulter, Paul Waring, Sergio Garcia and Alvaro Quiros eight strokes back. Ernie Els, the only player to win the Classic three times, finished in a share of 13th, with Tommy Fleetwood and Matt Fitzpatrick a further shot back in tied-16th.